Do you have a POS solution that allows you to properly analyse your business? 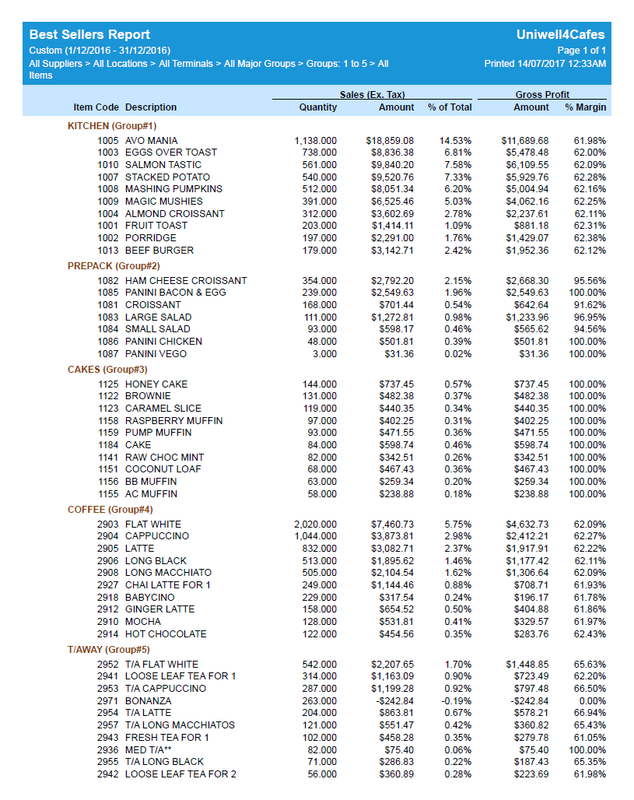 Do you know what sales data to look for to help make marketing and management decisions? Your Point of Sale terminal is a pivotal component in the success of your hospitality venue. As we have considered in other posts on this website, your POS collects the cash, tallies up the sales, allows you to control your pricing and menu, and acts as a communication hub. But there is another incredibly important feature of modern POS systems that can have a positive impact on your business success – detailed sales analysis tools. This report acts as a graphical representation of your venue’s sales activity. Best viewed over a short timeframe – such as for a specific day or week. Shows a 14 day sales trend, group sales for the period in order of dollar value of sales, hourly sales totals across the period and the top 6 best sellers. 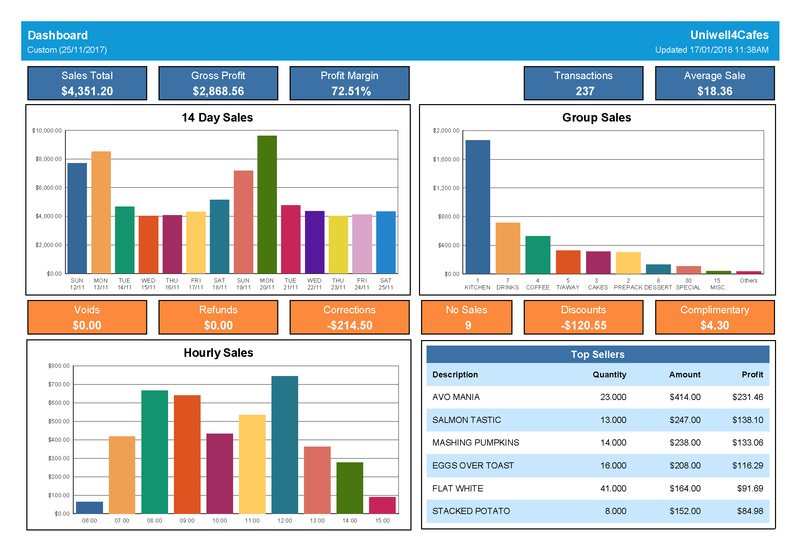 The Dashboard also shows sales totals, a transaction count and an average sale figure, as well as totals for critical POS functions such as No Sales, Corrections and more. We would recommend having the Dashboard report emailed to the cafe owner or manager (or sent to a shared cloud drive) on a daily basis once sales data has been collected from the POS. This provides a valuable snapshot of the venue’s performance for the day, and should their be any obvious anomalies, they can be dealt with quickly. The Weekly KPI report is designed for broader analysis. Best viewed over at least a month, it breaks each week down (from Monday to Sunday) and presents sales totals, transaction counts and average sales that allow for easy performance comparison. Of particular interest is the comparison with the same date period last year, so overall business growth can be measured and analysed. This report also provides totalisers for critical POS functions (refunds, voids, etc. ), allowing management to view trends in POS operations that may need addressing. This is an excellent report for checking how busy you are at specific periods across the week. 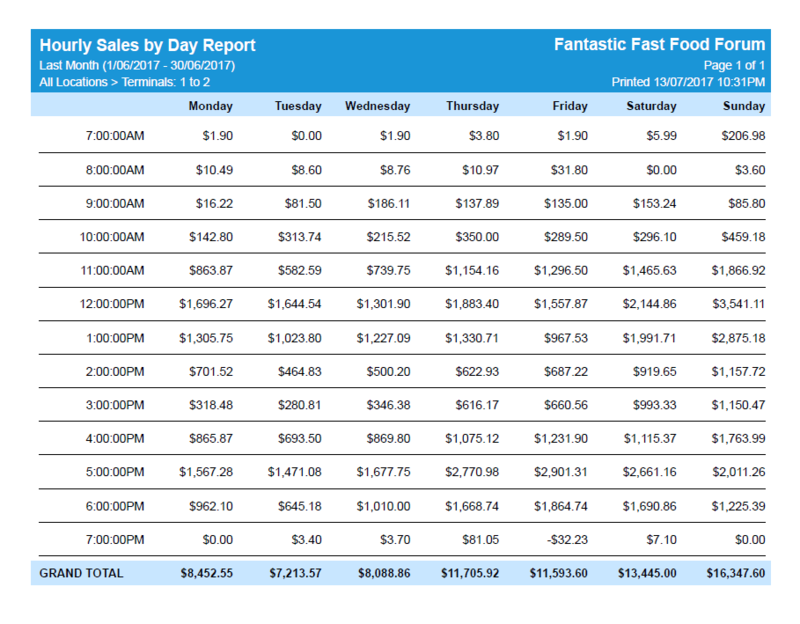 It provides a spreadsheet-like view of your weekly sales, broken down by hour. It can be viewed over a single week, but is also useful for longer term analysis – such as over a whole month or quarter. Viewing this report over a longer period would provide a truer sense of how busy your venue is at particular periods of the week. So how is this information useful? Firstly, it helps you to ascertain appropriate staffing levels. You can also view whether there are any specific quiet spots each day during your week, and then tailor your marketing (such as on social media) to increase sales during that specific period. Here again is an opportunity to use this information in your social media marketing. Featuring your most popular products, particularly those that you specialise in, helps to ‘show-off’ your venue. More and more, potential diners use Instagram and Facebook to assess possible cafes and restaurants, so showing your top products (and hopefully some positive comments) will help to draw new customers. 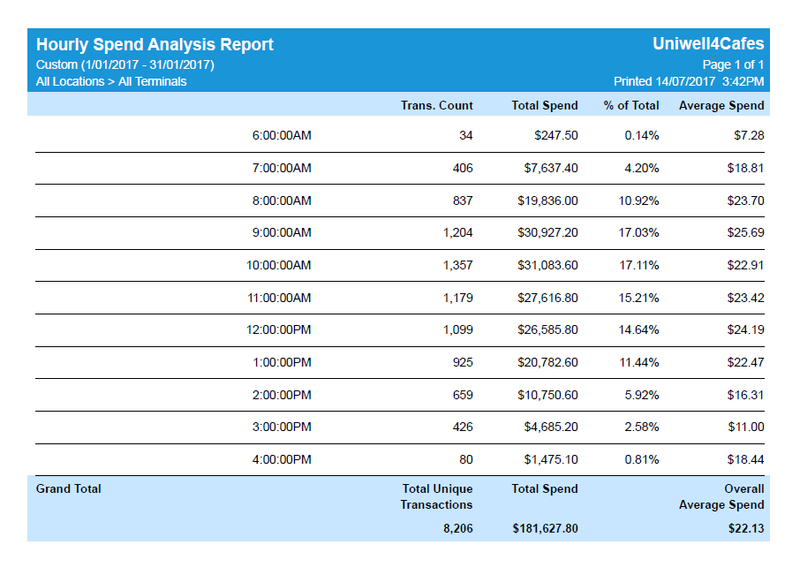 The final report we’ll focus on allows you to break down your sales across the day to see how much gets spent on average during each period. Are there opportunities for you to increase your product offering at times where the average sale is lower? This report also allows you to assess what is happening in your venue during critical periods of the day. For instance, if your aim is to increase your involvement in the ‘breakfast market’, what are you targeting as an average spend? 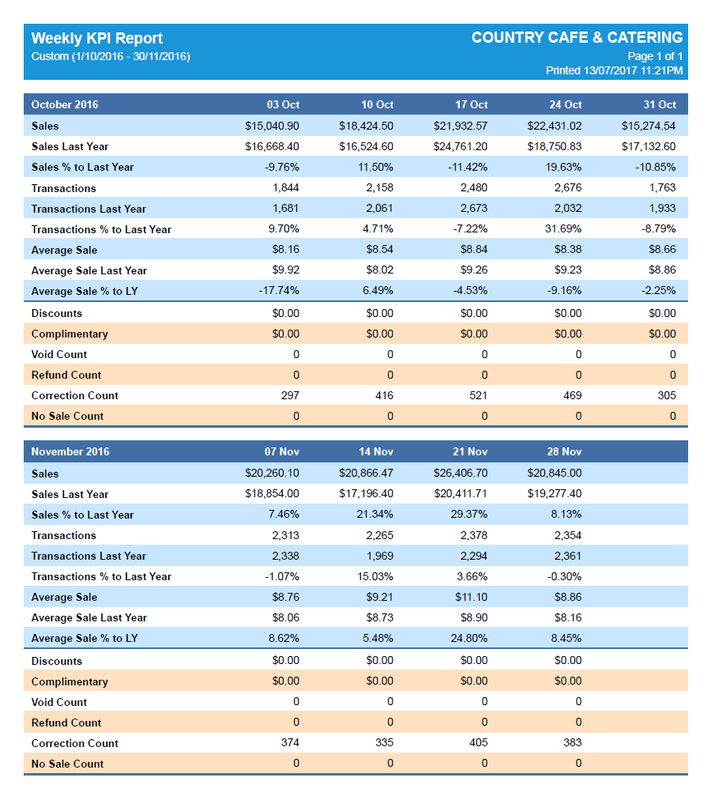 This is another report that is beneficial when viewed across a month or a quarter, as it demonstrates averages and shows you where opportunities for increased business might be found. With all of these reports, one of the keys to benefiting from the data is consistency. Develop a specific set of reports that you view each day, each week and each month. Viewing the same reports regularly means that you will be in a better position to make objective comparisons and spot trends and opportunities. Make sure you choose a POS system that can provide this kind of information, and take full advantage of the sales analysis tools that are available to you. The success of your hospitality venue depends on it. If you would like to know more about how a Uniwell4POS system can help you to manage and grow your venue, please contact Reg at BizStar. This article was written for Uniwell4POS & has been used with permission.